Learn about Barbados by reading Barbados - The Perfect Paradise by Evelyn Robinson, Travel Writer. It features a mini, but thorough tour of the destination, plus all you'll need to know to plan your trip including getting there, objective information on places to stay and eat, and things to do. At the end of the article, we've provided a summary of the contact information for your easy reference. Enjoy! The beautiful sparkling ocean lapping onto the shores of a fair beach, covered with lush palm trees; sounds like the ideal vacation, doesn’t it? Barbados offers this and so much more, despite the size of the island only being 166 square miles. For such a small island, Barbados receives a lot of tourists every year, so the locals who refer to themselves as Bajans, are very friendly and eager to give you directions, or explain about the local history. 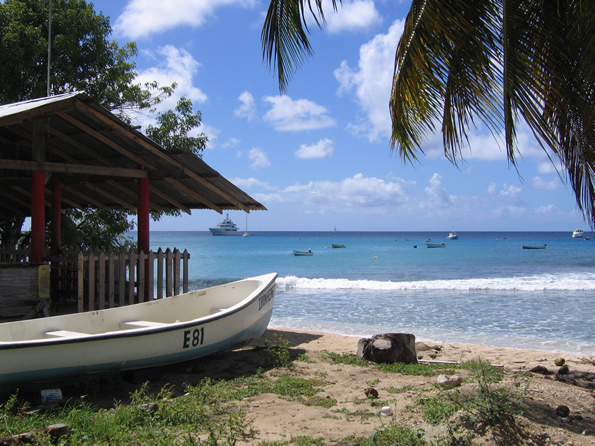 With a relatively constant temperature around 28C – 30C Barbados offers a nice climate to relax in. There’s a very active nightlife, as well as some beautiful landscape and historical buildings to discover; whether relaxation or exploration is the focus of a vacation here, Barbados has something for everyone. The west side of Barbados offers a lot of luxury accommodation and areas to relax. This side of the island is relatively flat and the ocean is generally calm, the beaches are shaded with large palm trees and it is definitely the place to go if relaxation is a number one priority. Speightstown is one place to visit for beautiful beaches but also a flavour of Barbados’ history. Once one of the busiest ports on the island it has fallen to disrepair, but the town itself still holds an air of traditional charm, with historical old buildings lining the streets. Holetown on the west coast has stunning beaches, and some excellent local cuisine - try Ragamuffins; the atmosphere is welcoming but retains a local feel, as well as the food itself offering some tasty Bajan classics. For something more suited to a special occasion try The Tides restaurant, situated perfectly on the coast and boasting to be one of the top places to eat on the island. Although less populated than the west coast and slightly less accessible, this coast boasts some exceptional views, it’s an area that cannot be visited without a camera. This side of the island is bombarded with the waves of the Atlantic Ocean; the results of these waves can be seen at Bathsheba, with large rock formations having been worn down just at the base by the crashing waves. Bathsheba is a must see whilst visiting Barbados, the rocks themselves look as though they could overbalance at any time, but they have stood as they are for many years. The east is also ideal for people who enjoy surfing as the Atlantic waves accommodate for this perfectly. This area is the main clubbing area of the island. It is peppered with places to stay for people looking to go out and enjoy themselves, as well as many clubs perfect to get a taste of the local nightlife. Most of these places will serve food until mid-evening, so if eating and partying is high on the agenda the south is ideal. An excellent place to visit to have a taste of the local food, drink and nightlife is The Boatyard, perfect to meet the locals and see a little more of the local culture. The very northern tip of the island hides a gem that is a must visit; Animal Flower Cave. For a small fee a local tour guide will show you through a group of sea level caves, allowing for some amazing pictures, as well as a chance to see sea anemones that react to being touched, fun for both children and adults alike. Slightly more inland offers more picturesque places to visit including Welchman Hall Gully, a place that really boasts a lush tropical feel, and Harrison’s Cave, a beyond breath-taking maze of caves, packed with naturally formed stalactites and stalagmites. Also well worth visiting are some of the plantation houses and churches that are inland, including St. Nicholas Abbey – one of only 3 genuine Jacobean mansions left in the western hemisphere. Bridgetown is the capital of Barbados and offers a wide variety of activities and sights to be seen. With historical buildings lining the streets, as well as trendy stores, cafes and also traditional local markets, Bridgetown will always please. Every year in the first week of August, Bridgetown will be filled with people for Crop Over and Kadooment Day; everyone is dressed in costume for an all day festival of dancing that finishes near the centre of the capital, although the party atmosphere will carry over for a few days after that too, a perfect celebration of the local culture. There are many options for travelling to Barbados, with flights available from almost any location straight into Grantley Adams International airport of Barbados, which will leave no more than an hour drive to most resorts and hotels on the island, with a list of taxi costs available inside the airport upon arrival. Many cruise companies include Barbados as the highlight of their Caribbean tours also such as Carnival cruises – some will even include a few days to spend on the island before taking off elsewhere, whereas others will only dock for one day, so make sure to choose the correct cruise. The island itself has many means of transport to get around, including buses and taxis, as well as the option of car hire to make life easier. With many hotels and resorts across the island there is plenty of choice. Try the Hilton Barbados on the South-West corner to be close to Bridgetown and plenty of local amenities, or the Tamarind on the west coast for a taste of relaxing luxury. To really get a taste of the local food, try a small local restaurant such as the Waterfront Cafe located in Bridgetown, or on a Friday night head to Oistins fish fry on the south coast, where fish caught locally is cooked and served, whilst a market selling crafts and jewellery takes place alongside the areas to buy and eat food. Be sure to try the local delicacy of flying fish whilst here, it really should not be missed! Notice: This information is current as of December 2012. It is recommended that you contact the numbers, and/or visit the websites above to determine any changes to the information.